I made this yesterday and it tastes delicious! The consistency is more along the lines of what I remember that velveeta stuff to be. I’m tickled with the agar, as it’s my first attempt at any type of solid “cheese”. I was unable to get it to melt, though, after slicing some super duper thinly and placing on top of some stuffed mushrooms and baking at 425 degrees for 30 minutes. It got brown around the edges and was a bit wobbly if touched while still hot, but didn’t do any actual melting. Any further helpful hints to help in that arena? Thanks for sharing all you do. You are greatly appreciated! Thanks Linda, glad you like agar – I love recipes with it also – it’s becoming an essential ingredient. I find it melts best at lower temperatures 150c but the melting isn;t directly comparable to real cheese. If you are looking for a runnier melting cheese I would recommend the cashew mozzarella pizza. This cheese I usually just have sliced and solid. Hi Judy, sorry to hear that. Are you using agar-agar powder and stirring constantly to stop it sticking to the bottom? Grateful for the tasty adventure opportunities, nonetheless. Thanks for your time and shared knowledge. Peace. Thanks for that – you are right my sentence there is misleading. I’ve updated it now. While it does melt a bit and brown it isn’t just like normal cheese. It’s more like normal low fat cheese – where it melts a bit and browns but doesn’t go runny. It’s been so long since I’ve cooked with any normal cheese I forgot what it was actually like! Tried it sliced thinly and layered on a grilled cheese sandwich today and it was perfect! Real cheese used to melt a touch too much for my liking when it came to the sandwich scene. This version is just right minus the gooey mess in the pan. Yay!! This stuff is totally addictive and easy to make. 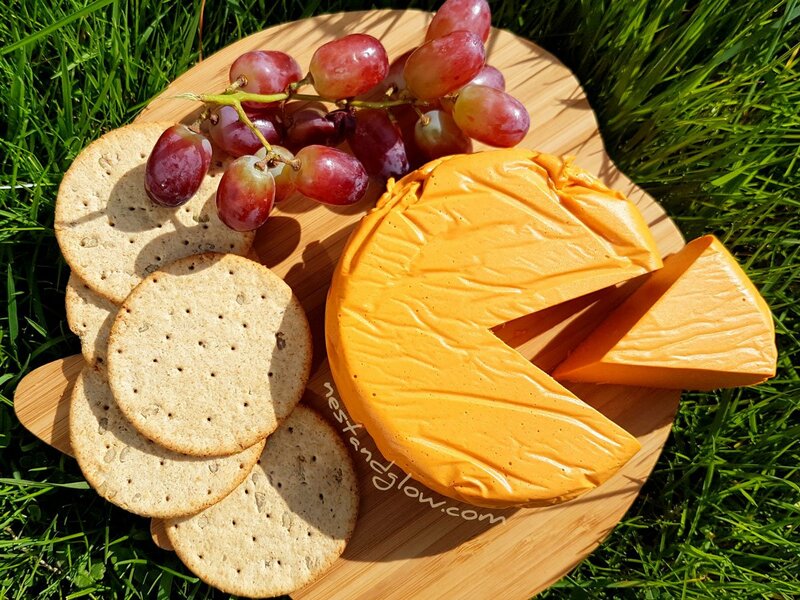 Much better than the high oil and fat vegan cheeses that shops sell. Perfect on a cracker. 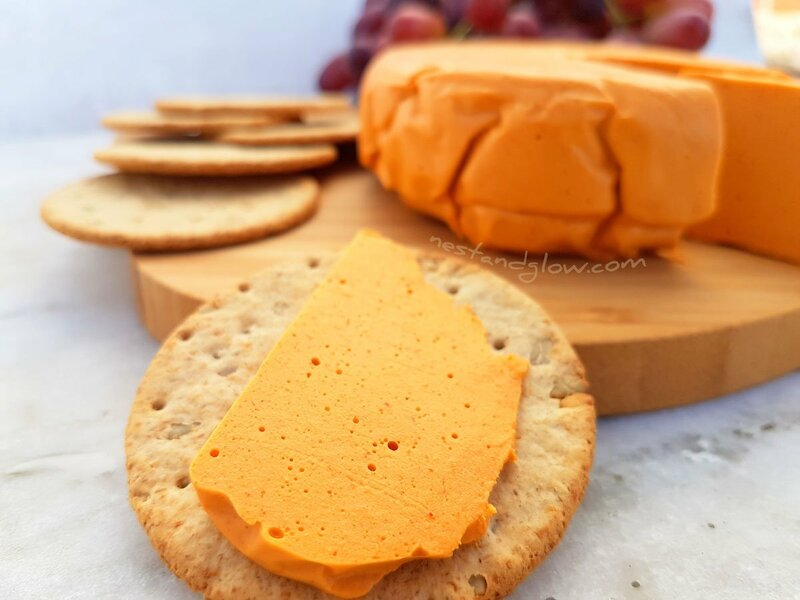 Please make more like this so I can make a vegan cheese board! I just wanted to clarify the amount of cashews used. The written recipe states 1 cup, whereas the video states 1 1/2 cups. Could you help, please? It looks so fantastic I don’t want to mess it up! This looks great… I am not vegan but have recently discovered that I am allergic to dairy so am always on the lookout for simple easy recipes I an use to substitute for dairy products…. Just wondering how long this keeps…. Off to look at some of your other recipes now…thanks. so delicious the recipee, how many calories have all the cheese? For some reason mine didnt ever harden. I used to agar agar flakes. Do you think thats what caused it? Could I replace the agar with kappa carageenan? I’m not sure sorry, I avoid carrageenan as it has some bad side effects and agar does not. Hello, This looks beautiful and I love that the color is naturally derived! Could you tell me what size mold you used? I am thinking of making it into a block and just wanted to compare. Has there been an issue with setting? It’s been two hours and mine isn’t set. What can I do in the future to get it to set better? Hi, sorry to hear that I haven’t had any issues with it not setting. Did you use the powder form of agar-agar and boil it for about 5 mins while stirring? You can still try to get the cheese to set by melting again with some more agar agar. The only person that I’ve heard of having issues with it not setting used baking powder as agar agar was lost in translation. sorry I am having the same issue. My cheese never set and yes I was using agar bar. do I need to mix more agar agar and water? How do I add it to me soft cheese? The agar agar bar is not as strong, so I believe you need a lot more. I’ve not used it I’m afraid so can’t help much, lots of comments about this but I always use agar agar powder. 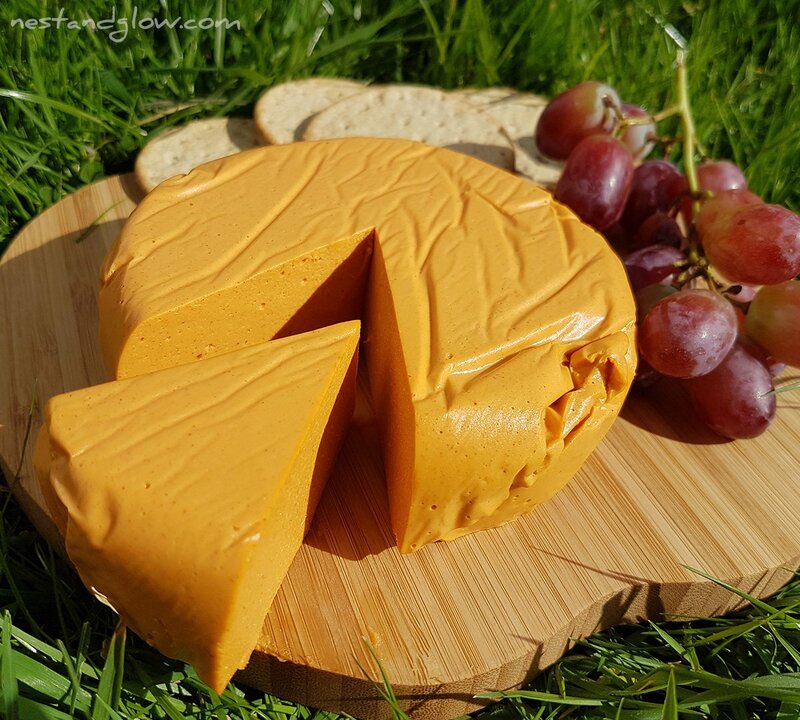 Hello, my name is Fabian I am from Uruguay and the products that have the recipe of vegan cheese here are difficult to get. I wanted to ask what product could supply maple syrup and nutritional yeast? Sorry for my faults but I’m using the google translate! That’s interesting, where are you? We have something called brewers yeast in the UK but it’s a very different product that can’t be used in this recipe. WONDERFUL RECIPE, delicious, easy and fast to do ♥ thank you for sharing, inspires me a lot! You’re very welcome 🙂 thanks for your feedback! Hi! Could I just use a dish to put it in or does it have to be a cheese mold? Hi! Would tapioca starch have a similarly affect to agar agar? Thanks for the response! I actually made it wth tapioca and it didn’t set but… it’s still so good! I’m going to use it to make Mac and Cheese tonight! Thank you! Hi, I just made this–it set up well, looks beautiful, and has a nice texture. I want to put it on the snack table at my next party. However, for some reason mine didn’t turn out very flavorful. Sadly, the one I made is quite bland. 🙁 I measured all the spices exactly and didn’t make any substitutions (and I used the 1 cup of cashews instead of the 1 1/2 cup from the video, did use agar agar powder instead of flakes or anything else, used a real lemon instead of bottled juice, used a fresh garlic clove, etc.). I’m so sad–any ideas about what went wrong? It’s extremely hot and humid here; not sure if that would have impacted it at all. Thanks in advance for your help and any ideas. I want to try it again but want to know what I might have done wrong first! I can’t wait to make this! Do I need to soak the cashews overnight? Delicious recipe! I just made it, and according to what I tasted on the spoon, I’m going to really enjoy this! One question I had, though. You said the juice of one lemon. Not to be petty, but lemons vary in size. The lemon I had must have been a large one as it tasted very lemony, so I added about a teaspoon of miso paste. That seemed to tamper the lemon down a little. Looking forward to enjoying it with my friends tomorrow! Thanks for the recipe! Hello.My name is Klodiana and in Albania you can not find a lot of things.I am finding trouble with agar powder and I want to ask if I can make this out of any other nut as: almond, hazelnut, Walnut? Cheeses are very useful in everyday life so I don’t want to loose this one.I prepared the mozzarella one but i used almond milk without going through the cheesecloth(as it is after the blending).It turns out crunchier and my daughter loves it.Thanks in advance. I used all of the right ingredients, except for the cayenne powder, where, instead, I used crushed red pepper flakes. I think you were spot on in your observation that the agar agar powder waters down the flavor. I used the amount of agar agar powder the recipe called for, perhaps a little more. The end result was a hard “cheese” that had no flavor. Will making this again with less agar agar powder (maybe on the underside of 1 tbsp) enable the flavors to dominate? do you use raw cashews? also, is this freezable if I can’t use the full amount in 3 days? This cheese is really good. I must have made it about a dozen times and each time I add some new flavour or spice with it. I think the best version has been when I’ve added caramelised onions to make a smoked caramelised onion cheese. Tastes amazing, although I added a bit more salt to taste after everything was blended to ensure a strong flavor. 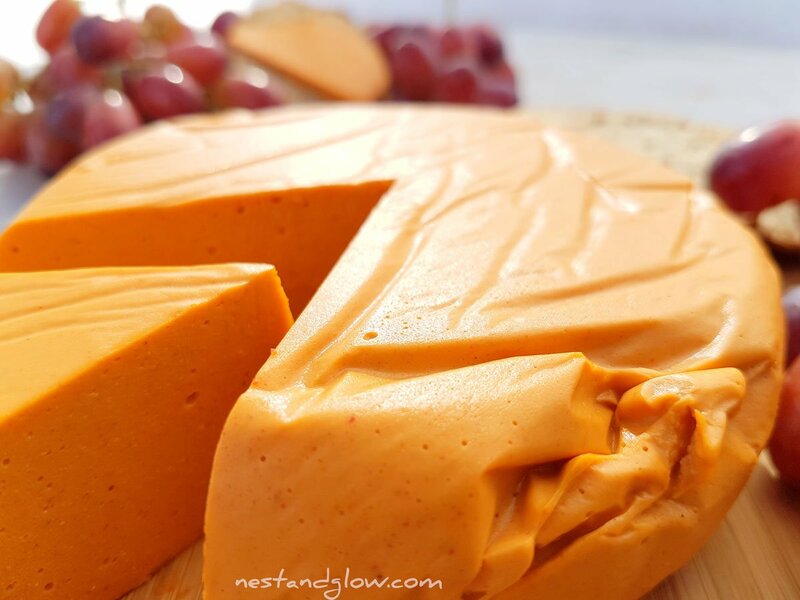 I didn’t have, nor new about agar agar until this recipe so I didn’t use it or sub it like you said it would be ok to do… but my cheese didn’t harden at all. I tried freezing a bit but when transferred back, it went back to liquid. Is there anything that can be adjusted? Thanks! Your recipe looks great, reads well, comments great but I have just tried to make it (followed the recipe exactly) and my vege-gel (agar agar) set before I could add the cashew mixture. Has this ever happened to you? Your recipe says to take off the heat before adding mixture should i have kept it on the heat? It is all down the toilet now but would like to try again if you have a reason for vege-gel setting. Hello, I’m sorry it didn’t work for you – I always test recipes several times before posting and do update them with feedback. However looking online the brand you used doesn’t contain any agar agar so that sounds like where you are going wrong. I used pure agar agar powder. My husband and I are in our mid 60s. 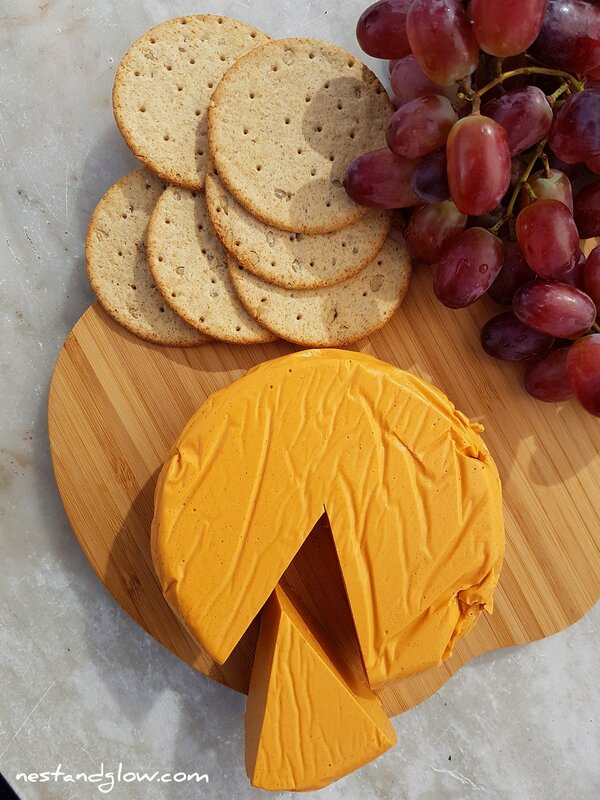 To my surprise my meat and potatoes husband said we should go vegan for health reasons……we feel wonderful but miss cheese, thankfully I found your recipe for smoky cashew cheese. Question…are the cashews raw that must be soaked in water first? Could one use extra firm tofu in lieu of cashews? I have never developed the taste for nuts and although so many recipes claim that one cannot taste the nuts, I can.